May 23rd, 2018. 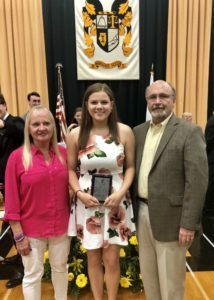 We are pleased and proud to announce the third and fourth scholarships for the class of 2018 were awarded to Hinsdale South. The first scholarship awarded is valued at $1,500 annually, renewable for four years and is valued over 4 years at $6,000. This is a category 1 scholarship. The second scholarship awarded is valued at $2,500 annually, renewable for four years and is valued over 4 years at $10,000. This is a partial category 3 scholarship, it was split in half and awarded to two students. Our first scholarship today is awarded to Neha Chinwalla. 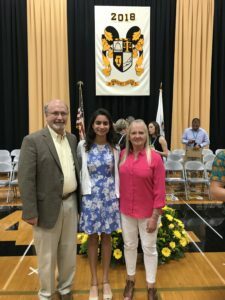 Neha is a star track team member and is the first individual to qualify for the state finals from Hinsdale South in a number of years. Neha is also student council president, National Honor Society president and plays the flute in the band. Neha’s essay discussed her challenges tutoring a six-year-old with ADHD. He had a negative self-image and was distrustful of strangers. Nina story told how she worked with Jack and slowly helped him to overcome his blocks to learning. Our hearts go out to Neha and her family, her mother passed away two days before she received this scholarship. Our second scholarship today is awarded to Sydney Benson. Sydney interviewed with the KJO Scholarship committee for one of the Category 3 scholarships. Sydney was a four-year volleyball player and three-year team captain. She says in her introduction she’s a quiet leader that leads by example. In her interview with us, she was not quite! We loved talking with her. Congratulations to both of these young women KJO Scholarship recipients.